Yeah, finally I made it! Actually I finally made two things. 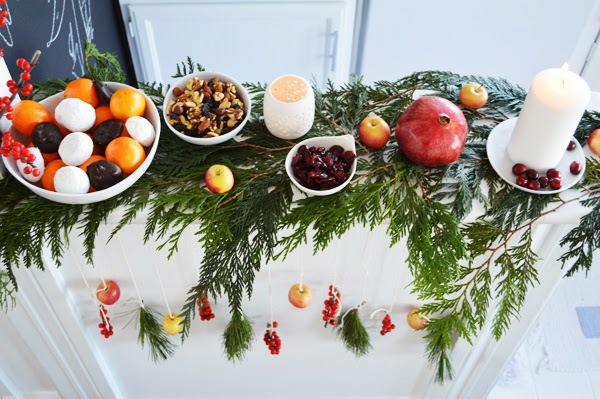 No.1: I jazzed up our apartment with all things Christmas – tree shines, advent wreath decorates the table and I set up a small holiday vignette to hold some candles and sweets, like gingerbread cookies, nuts and clementines so we always have something to nibble during the holiday season. 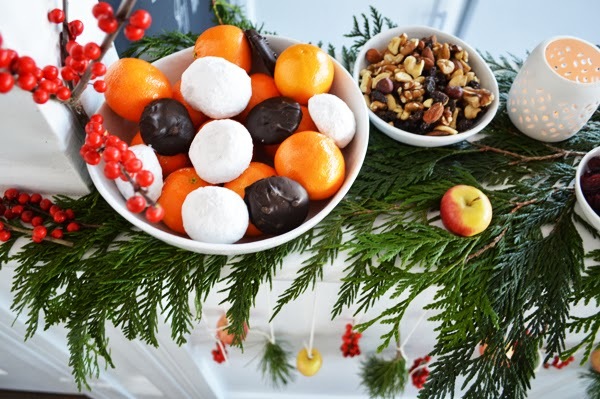 Not that we might get hungry, but I love having holiday treats around the house. 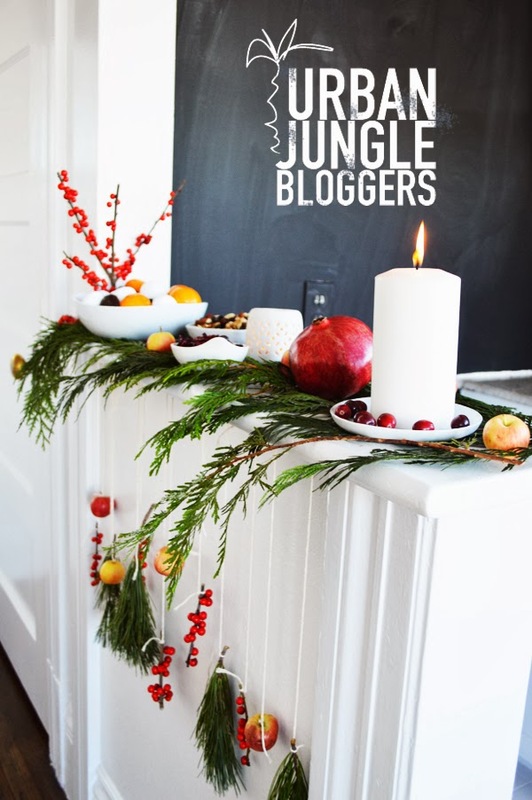 This brings us to No.2; with my holiday vignette I’m finally participating in the cool blogger challenge Urban Jungle, which was started couple months ago by lovely and smart fellow bloggers Igor of Happy Interior Blog, Jocelyn of The Little Room of Style and Judith of Joelix. They love plants of all sizes, colors and shapes. So it was only natural for these guys to start a challenge where they assign a green theme and everyone is welcome to interpret it in their own style. For December the theme was Green Festive Decoration Vignette. 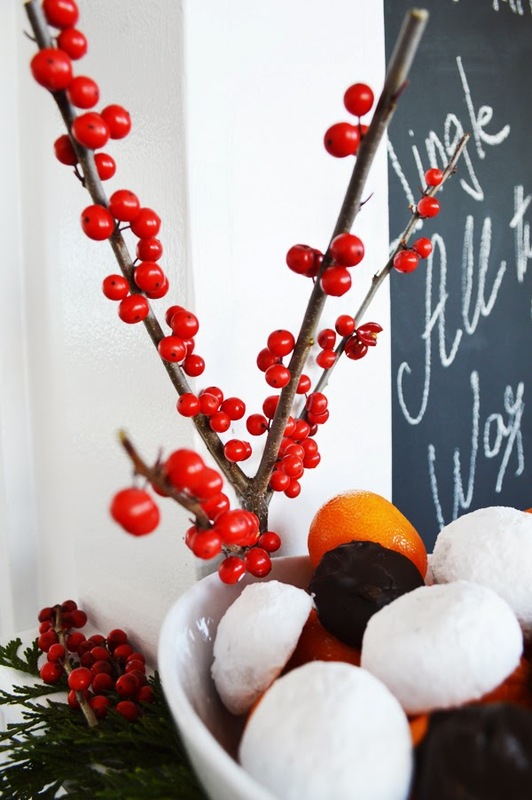 The name says it all – add some greenery to your holiday decoration. And that’s what I did. This year I wanted to stay traditional in colors and details. Lots of green and red with some color splashes of orange and white. Half of my decoration is from the grocery store, natural and inexpensive. 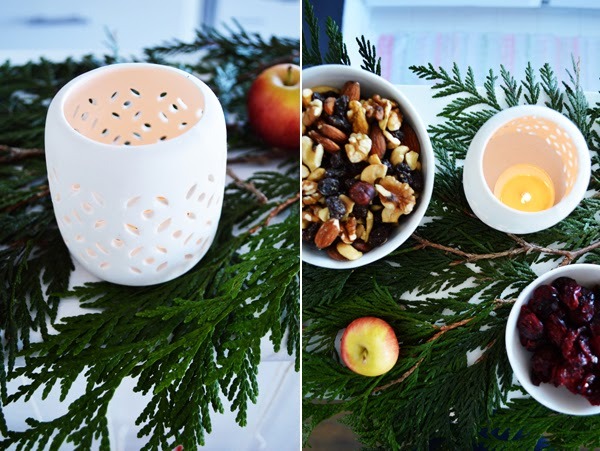 The other half are white dishes and a candle from Crate & Barrel – I love their Mercer Collection, white, organic-shaped and a little bit rustic. You can use it with everything. A small partition between our kitchen and the living area served perfectly for my cozy holiday corner. I just layered greenery on top, added munchies in bowls, two candles and used some apples and pomegranate as decoration. 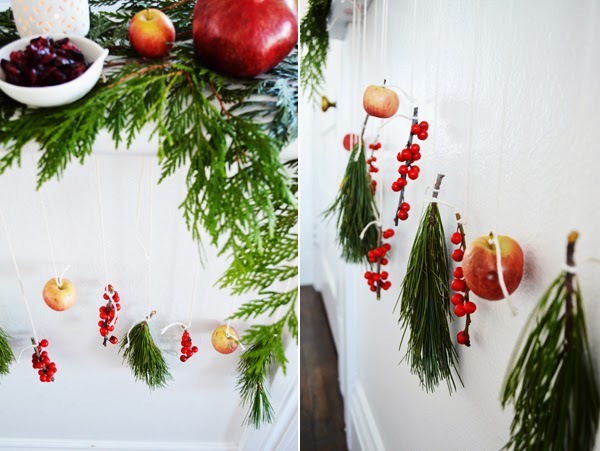 Hanging winter berries, branches and apples gave the whole vignette a twist. Would love to hear your thoughts on this? 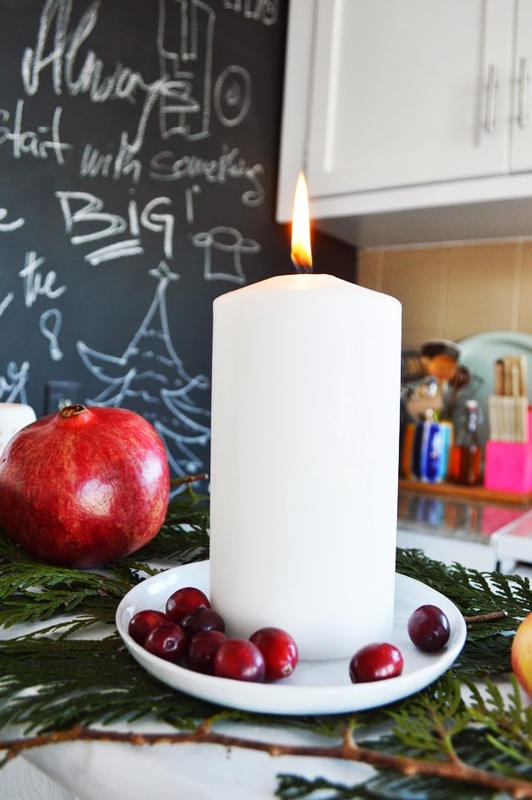 Do you like traditional Christmas when it comes to decorating or are you more likely to try out new things? And if you want to participate in this challenge you can still do it. Just drop a message to Igor or Judith on Twitter and they will be happy to provide you with more information. 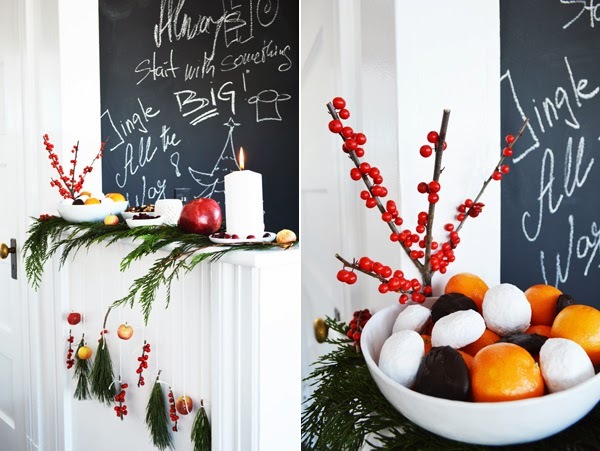 Now go and check out more festive holiday vignettes.